As adaptation moves from theory to practice, there is a need to identify and prioritise adaptation interventions, while ensuring Value-for-Money (VfM). This can be particularly difficult given the long time-scales for climate change and the high uncertainty, and the large number of possible risks and even larger number of adaptation options to choose from. To support this, DFID has produced a framework and set of tools and case studies on early VfM adaptation. 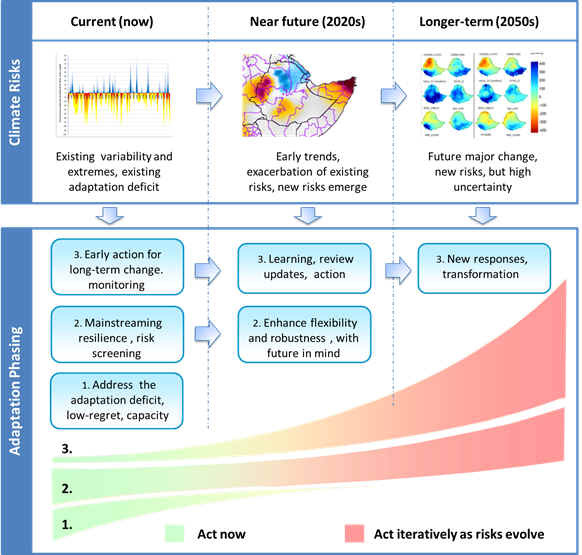 This uses an iterative climate risk management approach, as recommended in the recent IPCC 5th Assessment Report, which starts by addressing current climate variability and extremes, and then considers future climate change and uncertainty – shown in the figure below. In response, three types of adaptation decisions are identified for early adaptation, each with different needs in terms of economic analysis and decision-support. This framework can help in sequencing adaptation activities over time and for identifying early actions that offer good returns on investment. While it includes a focus on low- and no-regret options, it also includes priority areas for mainstreaming and early planning for the long-term. The framework can be applied in the scoping phase – in helping to sequence and prioritise climate risks and possible adaptation options – at both national planning level and project level. The framework can also be applied to more detailed economic appraisal and business case development. For an introduction to the framework, read more below or click on one of our introductory videos. For further information, click on the application of the framework for early planning (scoping or concept notes) or appraisal (business cases).